When first responders come to the scene during an extreme weather event their intervention into material conditions is shaped according to normative ideas about the rights and comforts survivors should be afforded. One of the projects SRL members Ned Crowley and Max Liboiron are working on, loosely titled “Disaster Data and Data Activism,” argues that the creation and organization of information is part of such interventions, and can even create a space for activism. While most “data activism” is thought to occur through data forensics and visualization, that is, though how data is used, we argue that the way data is collected and stored is also a place for activism. In contrast, the City of New York contracted its data collection out, and in some reported cases, City data was collected by men in full army fatigues using iPads in areas desperate for batteries and electricity. This technique of data collection likely also dictated some results. How you go about collecting data influences the data that you receive, and thus the conclusions you can reach about the nature and extent of the crisis. Your results start, in the case of canvassing, before you get to the door. While both grassroots responses such as Occupy Sandy and governing institutions such as the City of New York collected data in an effort to match immediate needs and aid, their canvasing forms also differed in addition to their clipboard politics. Occupy Sandy questionnaires often, though not always, paid attention to issues of community resilience, self-organization, radical inclusivity, and the notion that Superstorm Sandy was one event in a longer, chronic disaster characterized by wealth inequity and climate change. Occupy Sandy canvassers asked residents about their health before as well as during and after the storm, making a lack of overall healthcare part of the crisis. Occupy Sandy also continued to canvas months after the City concluded, gathering more information about growing problems with mold, “Sandy cough,” insurance, and continuing displacement. City government data tended to focus on categories of home ownership, the success of evacuation orders, and other metrics that matter for FEMA and government agencies. Thus, the data “picture” of the storm differs for each group. Occupy groups intentionally collected and organized data in order to not only provide straightforward material relief but also as a form of critical public engagement– what we call “data activism.” This activism manifested in the ways data collectors were trained to interact with interviewees, what questions were asked, what questions were not asked, and how data were “cleaned” when entered into databases. Are you 18 years of age or older and a resident of New York City?As far as you know, are you in a hurricane evacuation zone? [IF YES] Do you know which hurricane zone you are in? [IF YES] Which one would that be?) [OPEN END] Total # occupants? [IF EVACUATED] Did everyone in your household evacuate when Hurricane Sandy approached? Seniors/children? Anyone immobile? [IF EVACUATED] What convinced you to leave your home to go to someplace safe? [OPEN END] Medical attention needed? [IF DID NOT EVACUATE] Why did you not evacuate? [OPEN END] Potential leader? Did you hear any announcements from public officials saying that you should leave your home to go someplace safer before the storm approached? Community Network Represented? Did you evacuate your home after Hurricane Sandy had passed? Common Concerns within Community Network? The first canvas form paints a picture of circulation during the storm: who evacuated and did not, why, and how information circulated. In the second canvas, more systemic problems of day to day life in affected areas are recorded. Not only do these practices determine how Occupy groups (re)defined the storm, they also change what counts as disaster, aid, resiliency, and best practices for future extreme weather events. In effect, describing the storm and its effects via data determines the types of solutions that are deemed possible or impossible, just or unjust. The confluence of Occupy Sandy, data, and intentional data activism constitutes an opportunity to explore the politics of information-based representation around extreme weather. Such issues will become more important in our post-climate change world as disaster data become more consequential for describing storms to the public, perceiving their impact, and shaping collective response. Results from City of New York canvasing data, via the NYC After Action Report. Section of Occupy Sandy canvas form. In contemporary society, the public depends on media to circulate information of distant events. Likewise, policy makers, experts, and other decision makers rely on data about Superstorm Sandy as a privileged form of media thought to objectively describe the storm. However, like journalism, data’s representation of reality is necessarily interested, authored, framed, and thus political. Creating data involves correlating numbers and codes with entities that are not numbers or codes, a process that involves translation, transformation, and even interpretation. Moreover, when information becomes data by standardizing it in databases, messy, heterogeneous bits are “scrubbed” by being left out or changed. This is particularly the case with disaster data, the information collected during a natural disaster about human needs and infrastructural damage. Because of extenuating circumstances characteristic of disaster scenarios, data collected by grassroots and community groups during the immediate aftermath of Superstorm Sandy tends to be patchy and incomplete even as it structured immediate aid; forms were changed and reinvented on the fly as new needs emerged that responders did not anticipate, and canvassers often acted as data collectors, medics, and psychological support simultaneously. In such cases, the data were seen as the last priority, or certain forms of data were seen as more important than others, even across different households. As a result, disaster data is particularly messy and requires extensive interpretation and standardization before it can be put into databases and circulate as a dataset, that is, before data can be transformed from information about a particular case into aggregated formats that describes the storm overall. Data and databases are often seen as the digital, twenty-first century version of “the pencil of nature,” an authoritative, scientific format that allows an accurate reflection of truth with little mediation. Data seem given in advance of interpretation. Yet, in Lisa Gitelman’s (2013) worlds, “‘raw data’ is an oxymoron;” data is always already organized according to an external logic and narrative about what is important, valued, and useful. Disaster data makes the political, representational characteristics of all data media more apparent because of their unique coupling of extreme messiness and immediate import. For government and grassroots responders to extreme weather events like Hurricane Sandy, disaster data are a central way to mediate both the storm itself and responses to it. Assumed to be objective representations of the event, disaster data define the disaster and strongly shape response and rebuilding in a storm’s long aftermath. Investigating the process of creating disaster data demonstrates its inherent and intentional politics of representation. 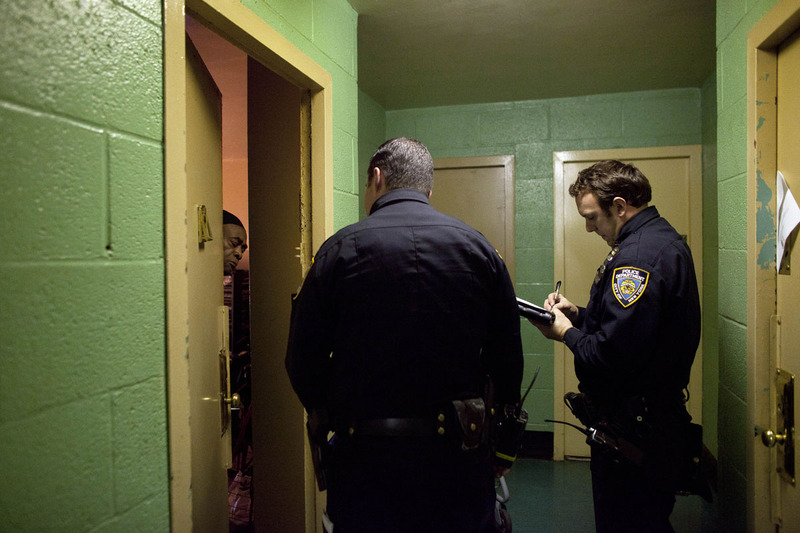 Door-to-door surveys conducted by about 100 members of the New York National Guard who have teamed up with numerous city, state and federal agencies. Image: NY1. If you have images, documents, or are willing to be interviewed about your work collecting data following Hurricane Sandy, please contact Max Liboiron at max.liboiron [at] nyu [dot] edu. For examples of some of the canvasing forms and training documents, see our volunteer group document page. We are also aiming to collect similar documents from the City of New York efforts though a current Freedom of Information request. Alex Howard, “Tracking the data storm around Hurricane Sandy,” Strata, October 29, 2012. Almklov, Petter. (2008). “Standardized data and singular situations.” Social Studies of Science 38(6): 873-897. Gitelman, Lisa. Ed. (2013) “Raw Data” is an Oxymoron. Cambridge: MIT Press. An Occupy Sandy canvassing training sheet explains how “clipboard politics” are important. Occupy Sandy canvassing training slide show.